At a recent triathlon just north of New York City, I had one goal: beat Tess Herzenberg. She comes from a competitive swimming background and I have reason to believe she’s hiding gills under her suit. I have more experience on a bike than Tess and spend as many summer weekends as possible escaping the city on two wheels with The Drops. Our running PR’s are within seconds of each other. During the race, she absolutely crushed me on the swim. As anticipated, I gained ground on the bike portion and had her within eyesight by the time we reached the second transition. A mere thirty seconds ahead of me, she was my carrot for the entire duration of the run. In the end, she may have beat me by two minutes, but she gave me a reason to wake up early and swim some extra laps in the pool. Out of the water and on my way to catch Tess. My favorite part about triathlons is how they level the playing field. There are some people who I realistically will never be able to beat on the track. Throw them into a tri, and all of the sudden I stand a chance. I’ll forever be a middle of the pack runner, but some combination of natural ability and an absolute infatuation with cycling has allowed me to become stronger in that realm, which compensates for my running speed. 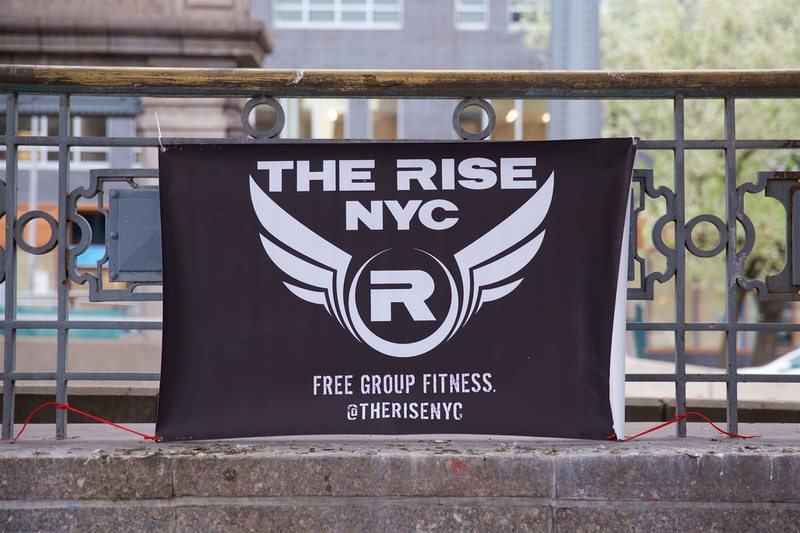 The Rise is lucky enough to have accomplished marathoners, ultra marathoners, bodybuilders, swimmers, yoga instructors, triathletes and track stars amongst us. Like me, they exercise with the Rise at 6:30 AM, yet somehow manage to sneak in additional training while simultaneously balancing a career and social life. They are able to accomplish what once seemed to me like races better left for the crazies. Inspired by my friends at The Rise, and in an effort to become the most badass version of myself, I registered to compete in the 2015 Lake George Half Ironman this September. My first triathlon was the Greenwich Cup in 2012, which I raced on a mountain bike fit for someone at least a foot taller than I am. I’ve completed several sprints since, but the half Ironman is new territory. While my training plan for all races–half marathons, Ragnars and sprint triathlons alike–is typically more of a shock the body approach (note: no training), I ultimately came to terms with the fact that I physically wouldn’t be able to walk away from all 70.3 miles of the race without a lap or two in the pool beforehand. Because of the Rise, I haven’t exercised alone in months. I meet #accountabilibuddies in my neighborhood and jog to the workouts. I grab a friend to lift weights at the gym or to cycle a few power laps through Central Park after a Rise circuit. When I started to open my big mouth about triathlons, the unanimous response was “Yeah, I’ve always wanted to do that. I’m in.” In the spirit of free fitness and Facebook events, we invited our friends to swim on Tuesday nights at the Asser Levy Pool at 23rd and the FDR. At the first practice in February 2015, two of us showed up. By the middle of June, our regular attendance topped 15 swimmers. Post-swim and pre-nacho photo at Asser Levy. A short couple months into this, we’ve realized that we’re onto something. Not only is the triathlon experience often prohibitively expensive, it’s nearly impossible to find a team with a wide range of skill levels, unlimited high fives, and no membership dues. The more people the talk to, the more I learn that completing a triathlon is a common goal amongst Risers. It’s a competition that offers a new challenge, allows sufficient bragging rights, and most importantly of all–it’s achievable. Between the Rise’s HIIT workouts, running with TMIRCE and cycling the Drops, we’ve covered most of our bases. The only thing missing? Swimming. I am excited and proud to introduce the Trihards, New York City’s first free triathlon team. We hold weekly swim practices at public pools throughout the city. We also compete and cheer together at triathlons all around the tri-state area (and hopefully beyond). Interested? Come join us! There’s still time to train for our next race, the Greenwich Cup Sprint Triathlon. If you’re lucky, we’ll even show you the swim cap trick. Trihard triathletes and #cheersquad at the Pawling Tri. Join our Facebook group for invites to the workouts. While our workouts are free, swimming in most pools is not. Sign up on the the spot for a membership to all New York City rec centers. $75/6 months, $150/year, or $25/year if you’re under 25.